I've been blogging for almost 9 years now and this is the first time I've ever heard of the tradition of ‘International Blog Delurking Week’. Parul's post tells me that it has been around for 11 years at-least. So, for the first time ever, I'm going to be a part of it. When I read about this last week, I was wondering if I should do it or not. I'm not the one to follow the stats of my blog closely or even check the traffic on it. While I do have a decent bunch of consistent readers, I do get some occasional ones too. Earlier, when I had just started blogging I used to bother a lot about the followers and the number of comments on my posts. As time passed, they did not matter much as I was just writing for the love of it. Now that I'm a sort of veteran in this blogging world, maybe I should stop and try to know my readers. I'm a very honest and a blunt writer, but if you have read my last post you would know that I'm trying to be honest in a nicer way now. I have pissed-off quite some people with my writing, I know that too. Well, I must have been really hurt while I did that. Else, there is no way that would have made it to my blog. Am I sorry about it? Well, no. For those who I have unintentionally hurt, I apologize if my words have hurt you. But, you need to understand that every one of us have an opinion and our own beliefs. Just because mine doesn't match yours, doesn't make it wrong. Still, if you are looking for an apology and since I'm trying to understand kindness better, I'm sorry. I hope you would still come back to my blog to read my posts and hopefully one or two of them would resonate with you. While I do not care much about the quantity, I always look forward to the comments. When I read them, I try to understand the psyche of the reader and what he or she thinks of my post. Their comments also help me understand the person they are and their choices and beliefs. While I know the regular readers on a personal level, I would still like to know what they think of my space and what else would they want to read from me. 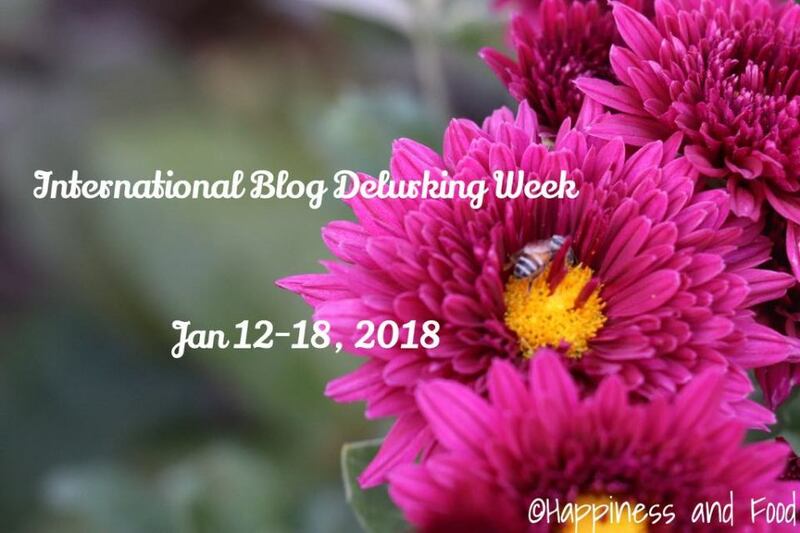 This year, my dear friend Parul is hosting the International Blog Delurking Week - 2018, and I'm happy to be a part of it and I would like to thank her for introducing me to this interesting concept. So, this International Blog Delurking Week, come, talk to me. Virtually. Well, if you recognize me in person somewhere, please do come say "Hello" too. I know many of you are silent readers who prefer to just read and leave or to leave messages on my Facebook page instead, but today, take some time out and leave a comment below. Anything would do. Well, not exactly "anything", but I hope you get what I'm trying to say. If you are a first timer here, please go to the 'The Lioness' tab you see above, to know more about me. But, if you have been here before and have lurked around one too many times, let me know what brings you here. Also, let me know what else would you like to read from me this year. While I've been doing poetry, fiction, book reviews and personal posts quite often these days, let me know if there is anything else you think that I could do justice to. Or which of the mentioned categories would you like to read more. This would help me plan my writing better and honestly, it would make me a better writer too. So, I thank you in advance for it. For those who visit regularly and leave a comment on almost every post, I love you guys. Thank you so much for taking some time out to read, understand and comment. I have always tried to reciprocate as much as I can. If I haven't yet, I apologize. Please do leave a link in the comments below so that I can visit you now. Again, thank you for being there. Don't think twice, come say "Hello!" My life has been an open book out here. For once, let me know my readers. If you read this post, please don't leave without saying anything. Just a "Hi" will do. But please state your name. Anonymous comments beat the whole purpose of delurking. If you are a blogger and want to do this too, please feel free to use the above badge and link back to Parul's blogpost. It is not mandatory to do this, but basic courtesy. Hey Rashmi, I know you have been around, so thank you for that. Thank you so much for your kind words. I'm glad to have been the inspiration for you to start your blog and give us some beautiful writing. And I find your post-font cute, too. Hugs! and happy week to you! Because I'll be back soon! I am not a lurker and I am glad you joined. It's a fun tradition. Hello hello...I too love comments more than anything else... It makes me feel good that people have read and taken some time out to leave a comment. So what does your evaluation reveal 😀that would make an entertaining read for sure. Thank you so much for being here regularly, Raj. Hi Soumya , I am a regular reader of your blog. I love it to bits and check it regularly to see if there are new updates. I love your command of the language and your ideas and thoughts. I find myself shaking my head in agreement to most of the recent posts. And then there is the book review. (I did comment once in a book review post.) I wait for your reviews. With the exception of one or two books, I find that I love the books that you recommend. The one or two that I do not like are because - sometimes I cannot take very sad/negative books. Keep up the good work, looking forward to read a lot of posts and book reviews this year. Thank you so much for coming here to leave this, Smitha. I recall you comment on a book review post of mine. I'm glad that my recommendations have mostly worked for you. Thank you again, do come back for more reviews this year. I am one of your silent readers.Honestly!!! I usually go MIA on my blog but I always read and love your personal posts, fiction and book reviews. After reading each post I think Gosh! I absolutely love this girl and I want to be just like her, but we are unique in our own way. I enjoy your Instagram feed as well. P.S. I am Poonam, forgot to mention in my previous comment. I am a new reader of your blog. I like to read more of personal posts on the blogs because this gives me a peek into the real person behind the words. You have been writing personal musings these days and I make it a point to visit your posts, if I am blogging in a particular week. It is nice to be honest with oneself with a little dash of kindness to others. I admire you for being conscious about it. Thank you for coming here, Anamika. I recently started reading your blog and I feel good about your writing. A little bit of kindness goes a long way, yes. Thank you. I was a regular reader earlier, but never commented much. Now I feel this place really cosy, warm and pretty much lovable. Hence I read and stop by to comment too. I believe I feel that you reciprocate more now than before. I find your posts more interesting and relatable now. Honestly I admire your writing and it is because of your poems, I attempted my first poetry. Somehow I found love for poetry here and continue it. Your poetry is best and now almost every post beats the before. Hugs Soumya. Thank you so much Jay for saying this so honestly. Something changed in me the last year and even though I'm not able to put a finger on it and say what it was, I know it is for the better. Thank you so much for all that you have to say. Love! I have been reading you since the end of 2014 or the beginning of 2015, Soumya. I love your poetry and fiction pieces. And of course, the non-fiction ones. I love your honest, authentic and bold views and writings. Wish you many more years of blogging joy! Keep writing. Thank you so much, dear Vinitha.